Networx® RJ11/12 Snap-In Keystone Jacks are available in a variety of 3 different colors intended to assist in the task of identification. Our RJ11/12 Snap-In Keystone Jacks are full compatible with all Networx® Blank Wall Plate and Blank Patch Panels. I've used these before. 1 bad jack in 10 is acceptable. I had no bad jacks at all. They were all good jacks. They fit Leviton and Tech plates real well. 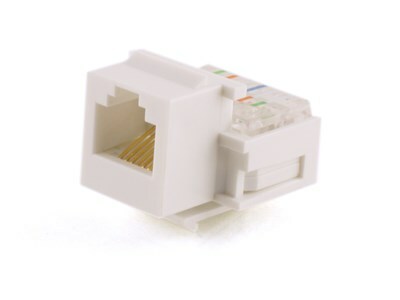 I used 2 of these to install a corded telephone extension. They were easy to fit - I used a Klein punch-down tool - and seem to be working perfectly. Highly recommended.